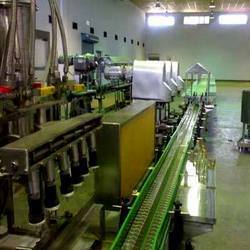 We are a leading Manufacturer of liquor bottling line machine from Ghaziabad, India. Our expertise lies in manufacturing various kinds of machinery for Liquor Bottling Line Machine, which include a comprehensive line of filling machinery. Technically advanced, our range of mineral water filling machine is designed to fill water in various sized bottles at a faster rate of filling. Clients can avail our range at most descent price. Looking for “Liquor Bottling Line Machine”?